This guy’s the star for me this week, picked just in time to beat being freeze-dried. It’s all I got from my tiny first-year plant, but under that succulent peel lie big hopes for next year if I fertilize starting in February. Whew, it’s been busy! CTG’s been on the road meeting wonderful people, collecting lots of ideas to share with you. 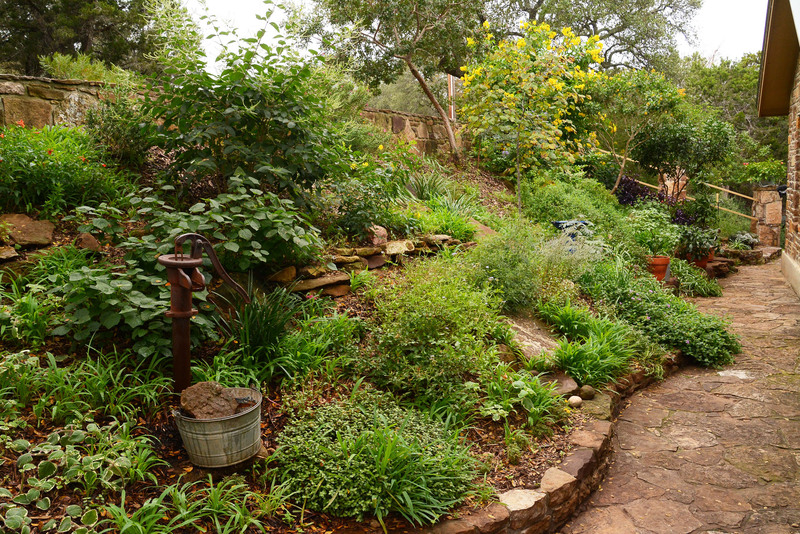 One stop was at East Austin Succulents Eric Pedley’s home garden. More later, but check out how he and girlfriend Julie Patton jazzed up a cinder block structure with stucco, paint and tiles. As much as I adore an orange and blue combo, Eric’s succulents truly push this design over the top. On my own, I headed to the Brazos County Master Gardeners tour in Bryan/College Station for head-spinning inspiration and such gregarious people. Here’s another eye-popping rendition of stucco over cinder blocks. As some of our plants go dormant (perhaps a bit sooner than expected), it’s a great time to move them. Well, at least SOME of them. Daphne explains why we don’t want to move cold-sensitive plants like plumbago, yellow bells, lantana and Pride of Barbados. It’s the BEST time to move roses, trees, and evergreen shrubs. We can move perennials like coneflowers along with asters and chrysanthemums once they brown up and form rosettes. We can also move dormant freeze-proof plants like firebush (Hamelia patens) though Daphne notes that older plants with more stored carbohydrates would adjust more easily. If you have a first year plant, wait until early spring. Succulents and grasses: let’s wait until April to move them. For now, simply relish the grasses for their smoky flowers and seed heads. Here’s an outstanding display of Muhlenbergia x Pink Flamingo and M. sericea ‘White Cloud’ in a garden designed by Scott & Lauren Ogden and Patrick Kirwin. Muhlenbergia x Pink Flamingo, a cross between Muhlenbergia capillaris and Muhlenbergia lindheimeri, was discovered by John Fairey at Peckerwood Garden. It’s one of several gorgeous grasses that Janet Rademacher from Mountain States Wholesale Nursery tells us about this week. A shorter more dense grass to 2½’ tall is Bull grass, Muhlenbergia emersleyi El Toro®. Its fluffy flowers turn from pink to tan in fall. One that’s been on my list for a while is Bouteloua gracilis ‘Blonde Ambition’, a taller version of blue grama discovered by David Salman of High Country Gardens. It retains “blonde” seed heads over winter to wave at you drinking hot chocolate inside. Janet likes Nolina texana (bear grass) for its grass-like prostrate growth that needs no pruning. She includes a few Hesperaloes, too, including H. nocturna that sports creamy flowers at night in summer to attract pollinators by night. Find out more. Before long, we’ll be raking leaves that fall faster than temperatures in Central Texas. John Dromgoole explains how even oak leaves turn into compost for free fertilizer. I often hear from folks about the giant rhinoceros beetle grubs that show up in compost piles. Don’t smash them! These guys are chomping those leaves and kitchen scraps to save you some time. They aren’t about to leave comfy quarters to bug your plants. On tour, compost was a salvation for Sara Breuer when she and husband Tim Mateer left glory gardening in east Austin for icky sticky soil in her new garden. The grass in back had died after trees felled a few years before, so they ended that problem with romantic outdoor living to watch the wildlife in the greenbelt beyond. Tim and their son Henry devised a way to hang the sun shade sails without blocking their view with posts. On many levels, Sara surrounds them with structure and plants for wildlife, especially since son Henry certified them as a Backyard Habitat as a Boy Scout. Henry also championed for chickens, who come to him on command when out for a brief walk. To keep a bit of lawn, Sara took it to another level. In front, she expanded raised limestone beds for herbs and perennials. In late May, bear’s breeches (Acanthus mollis) add dramatic flower spikes to their standout foliage. They dumped more lawn with raised vegetable beds, including this one that Tim built Sara for her birthday. At the front door, Sara razed grass to extend outdoor living and chats with strolling neighbors. She collects rain in a decorative urn and standard barrel for the vegetables and containers. Elsewhere, plants are pretty much on their own with handheld watering in driest times. Sara’s a creative person down to her toes. Now with Sol Marketing, I met her first when she helped brand CTG at KLRU! One clever garden idea is how she turned old bricks into plant labels with a Sharpie. Here’s another fun idea! Since Sara’s gotten into canning, she had some extra Mason jars. She removed the solar part of an inexpensive box store light for romantic glow lights.